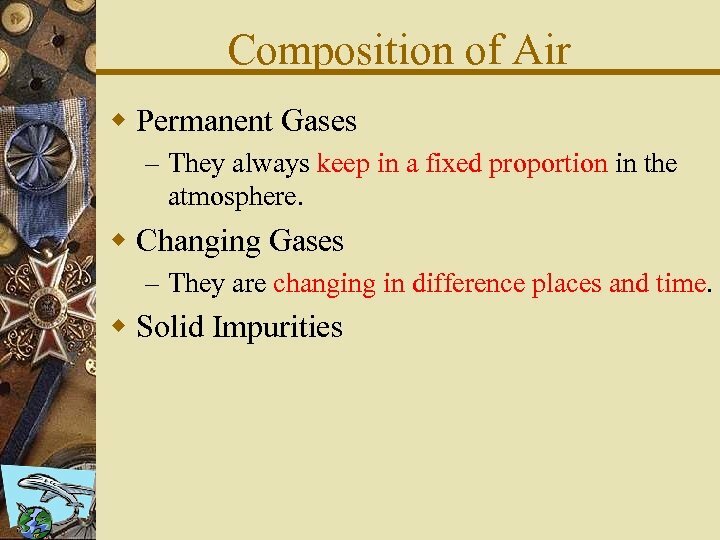 Changing Gases w Generally speaking, they are carbon dioxide (CO 2), Vapour (H 2 O) and Ozone (O 3). 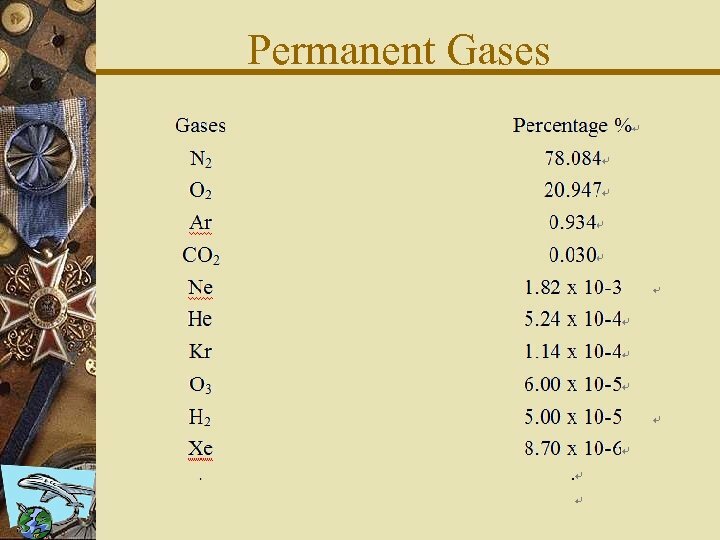 w CO 2: – Distributed in the lowest layer of the Atmosphere (Troposphere) – 0. 03% – It is one of the major green-house gases which can absorb terrestrial radiation (long wave radiation). 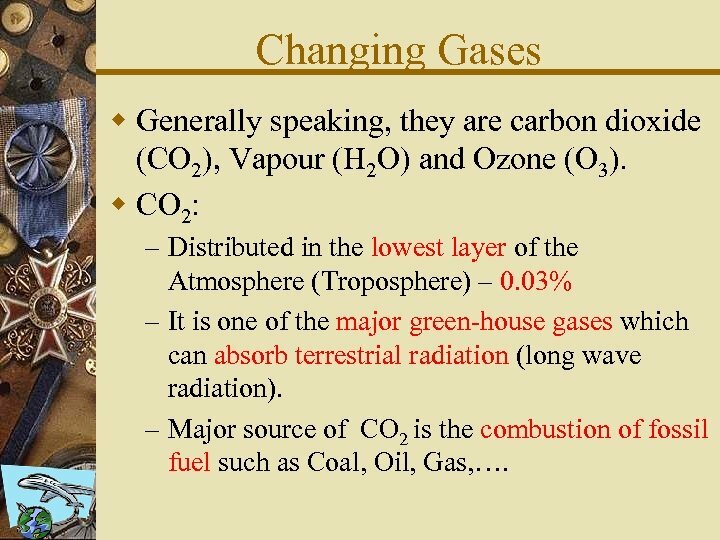 – Major source of CO 2 is the combustion of fossil fuel such as Coal, Oil, Gas, …. 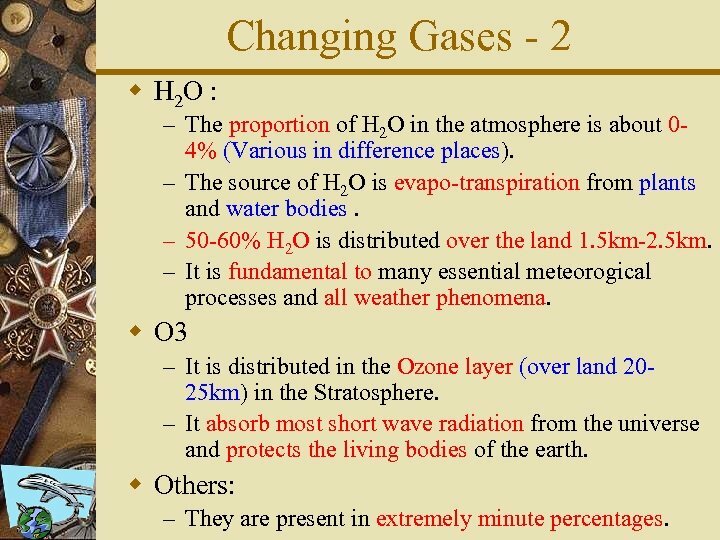 Changing Gases - 2 w H 2 O : – The proportion of H 2 O in the atmosphere is about 04% (Various in difference places). – The source of H 2 O is evapo-transpiration from plants and water bodies. – 50 -60% H 2 O is distributed over the land 1. 5 km-2. 5 km. – It is fundamental to many essential meteorogical processes and all weather phenomena. w O 3 – It is distributed in the Ozone layer (over land 2025 km) in the Stratosphere. – It absorb most short wave radiation from the universe and protects the living bodies of the earth. w Others: – They are present in extremely minute percentages. 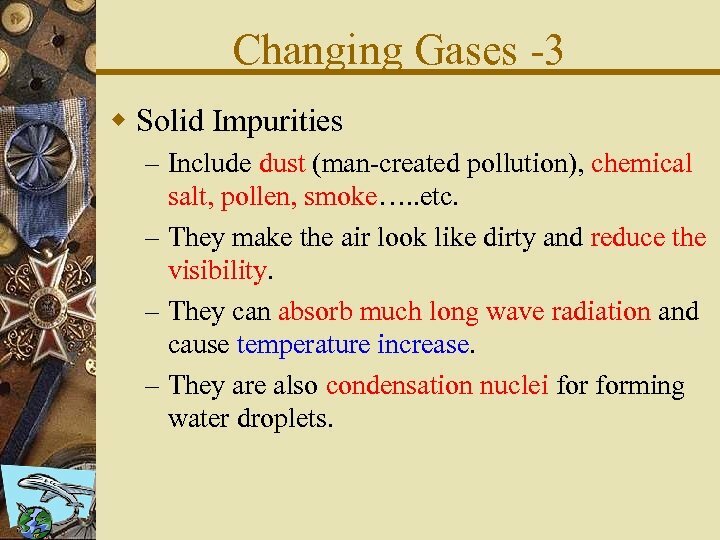 Changing Gases -3 w Solid Impurities – Include dust (man-created pollution), chemical salt, pollen, smoke…. . etc. – They make the air look like dirty and reduce the visibility. – They can absorb much long wave radiation and cause temperature increase. – They are also condensation nuclei forming water droplets. 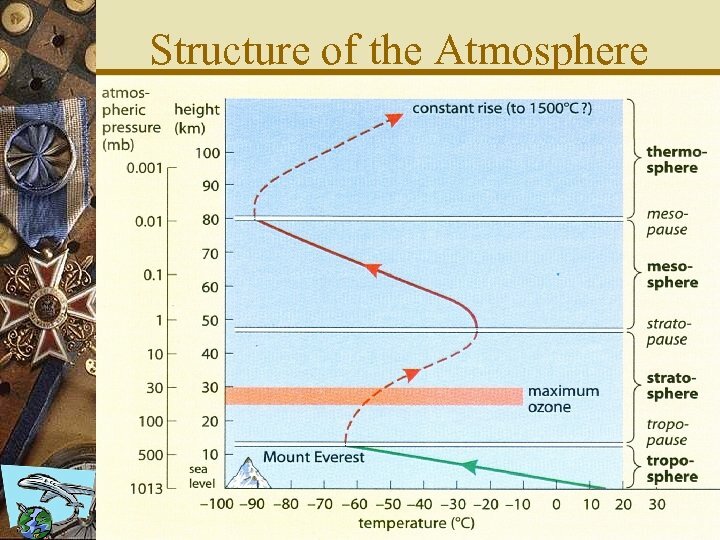 Troposphere w Its thickness approximately 8 km (polar region) to 16 -19 km (equatorial region). 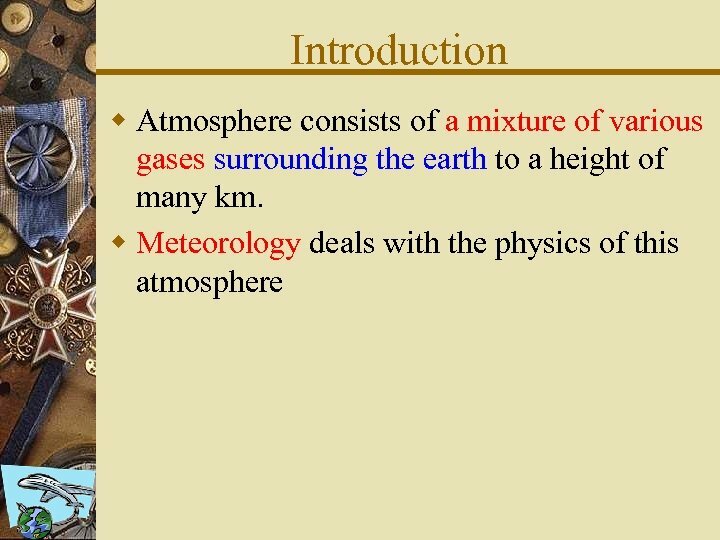 w Almost all weather phenomena, 75% of total mass of air, virtually all water vapour and aerosols are in this zone. w Vertical turbulence are most marked. w With Environmental Lapse Rate (-6. 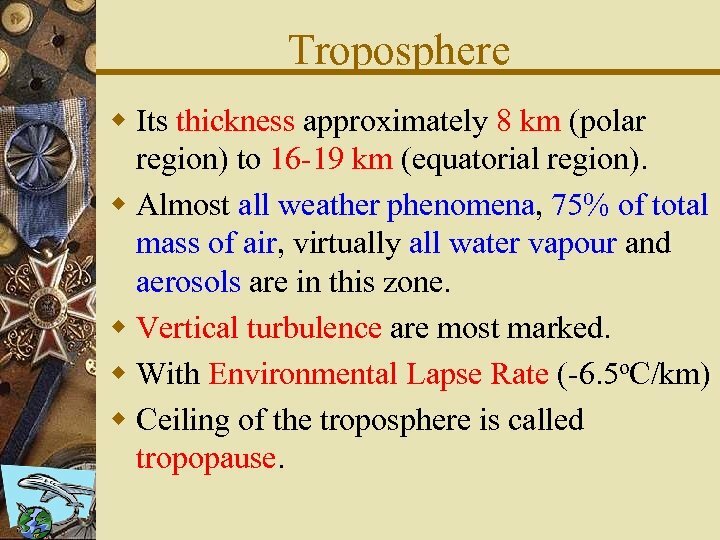 5 o. C/km) w Ceiling of the troposphere is called tropopause. Stratosphere w From the tropopause to about 50 km. w The lower layer is isothermal layer. w Cirrus clouds occasionally form in the lower stratosphere. 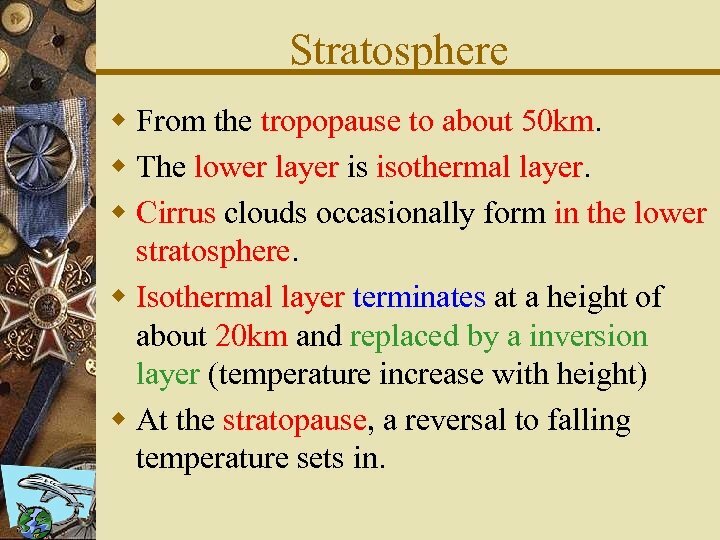 w Isothermal layer terminates at a height of about 20 km and replaced by a inversion layer (temperature increase with height) w At the stratopause, a reversal to falling temperature sets in. 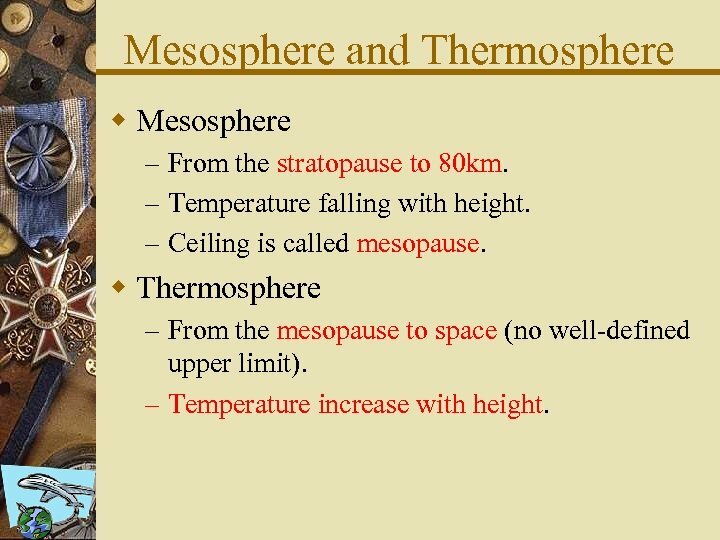 Mesosphere and Thermosphere w Mesosphere – From the stratopause to 80 km. – Temperature falling with height. – Ceiling is called mesopause. w Thermosphere – From the mesopause to space (no well-defined upper limit). – Temperature increase with height. 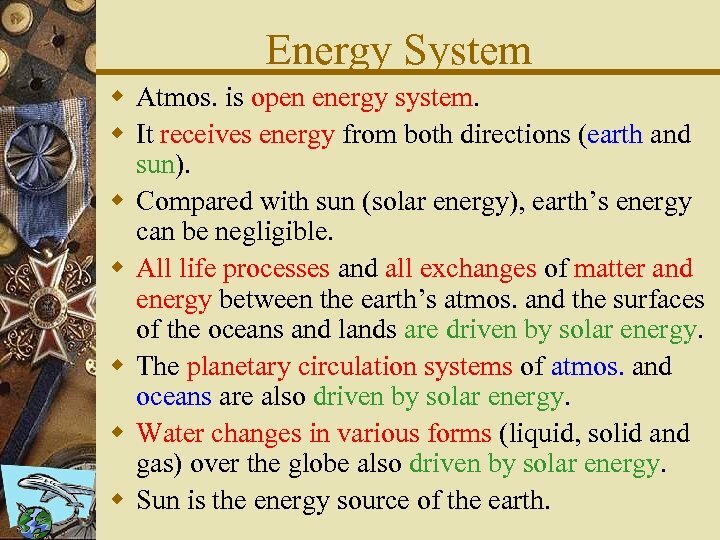 Energy System w Atmos. is open energy system. w It receives energy from both directions (earth and sun). 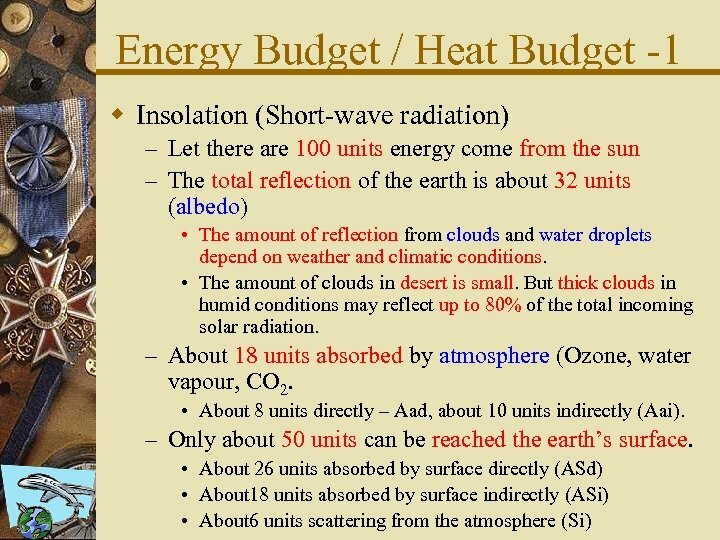 w Compared with sun (solar energy), earth’s energy can be negligible. w All life processes and all exchanges of matter and energy between the earth’s atmos. and the surfaces of the oceans and lands are driven by solar energy. w The planetary circulation systems of atmos. and oceans are also driven by solar energy. w Water changes in various forms (liquid, solid and gas) over the globe also driven by solar energy. w Sun is the energy source of the earth. 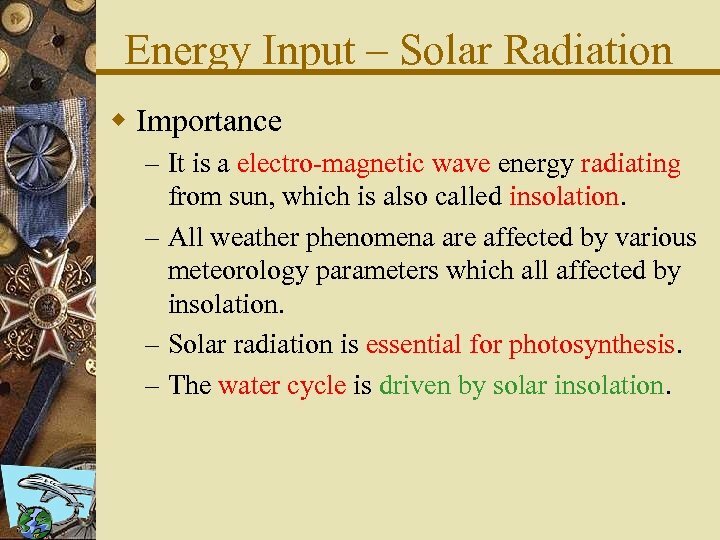 Energy Input – Solar Radiation w Importance – It is a electro-magnetic wave energy radiating from sun, which is also called insolation. – All weather phenomena are affected by various meteorology parameters which all affected by insolation. – Solar radiation is essential for photosynthesis. – The water cycle is driven by solar insolation. 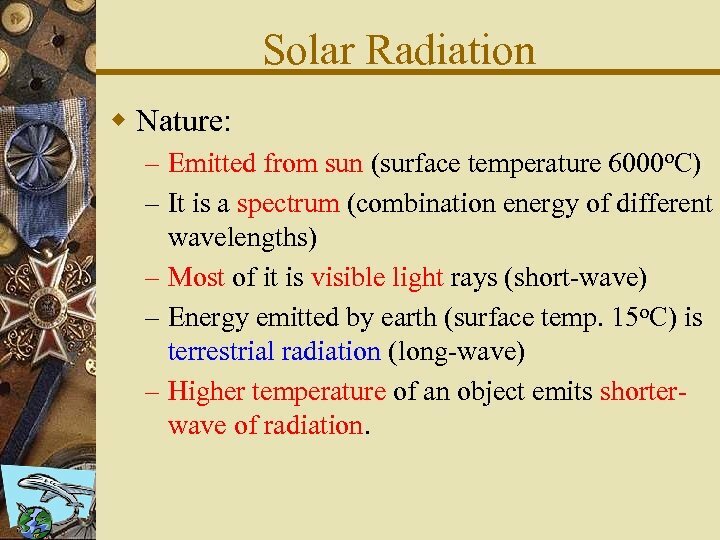 Solar Radiation w Nature: – Emitted from sun (surface temperature 6000 o. C) – It is a spectrum (combination energy of different wavelengths) – Most of it is visible light rays (short-wave) – Energy emitted by earth (surface temp. 15 o. C) is terrestrial radiation (long-wave) – Higher temperature of an object emits shorterwave of radiation. 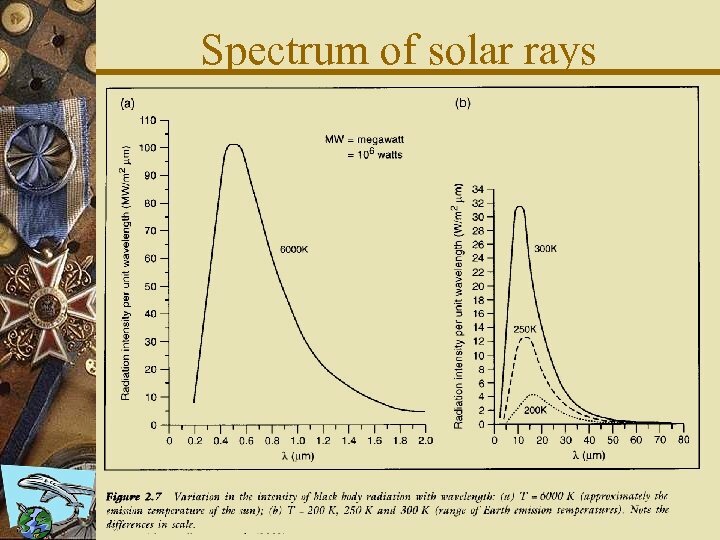 Spectrum of solar rays - 2 w Short-wave radiation (wavelength < 0. 8 micron) – Ultra-violet, x-rays, gamma rays, • Invisible and harmful for living organisms. • Most of them absorbed by thermosphere and ozone layer. – Visible lights (violet, indigo, blue, green, yellow, orange and red). • 90% of solar rays. • It provides most of the heat energy to the atmosphere. 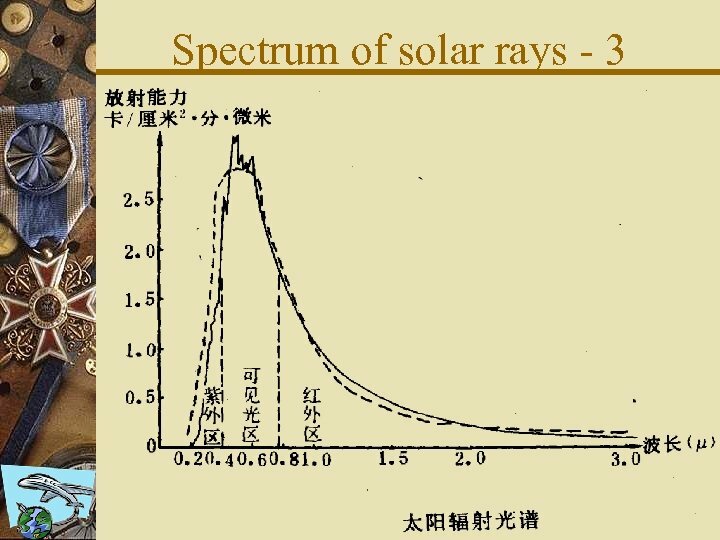 w Long-wave radiation (wavelength > 0. 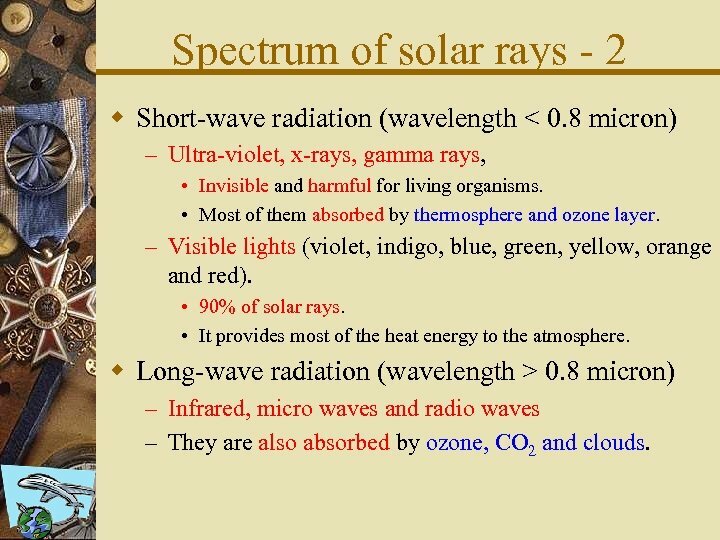 8 micron) – Infrared, micro waves and radio waves – They are also absorbed by ozone, CO 2 and clouds. 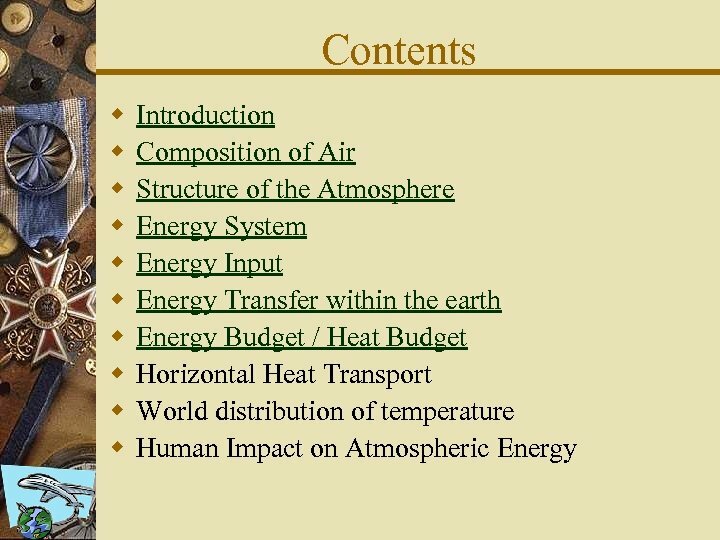 Energy Transfer within the earth w Receipt of solar radiation at the top of the atmosphere. w Receipt of solar radiation at the earth’s surface. 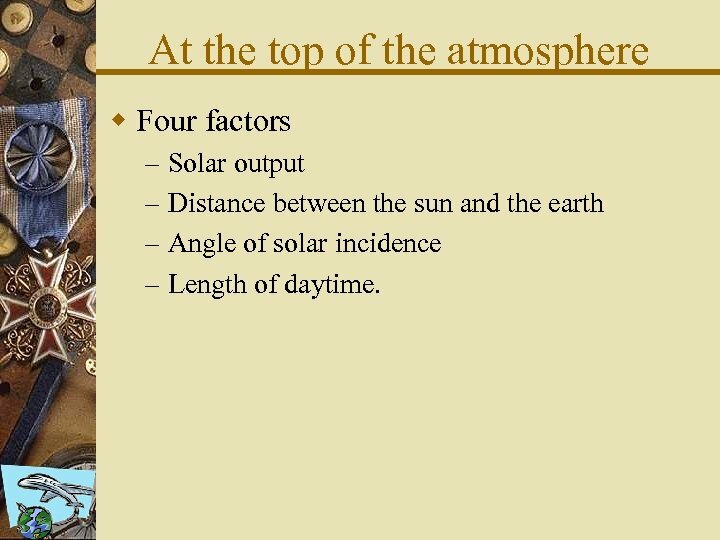 At the top of the atmosphere w Four factors – – Solar output Distance between the sun and the earth Angle of solar incidence Length of daytime. 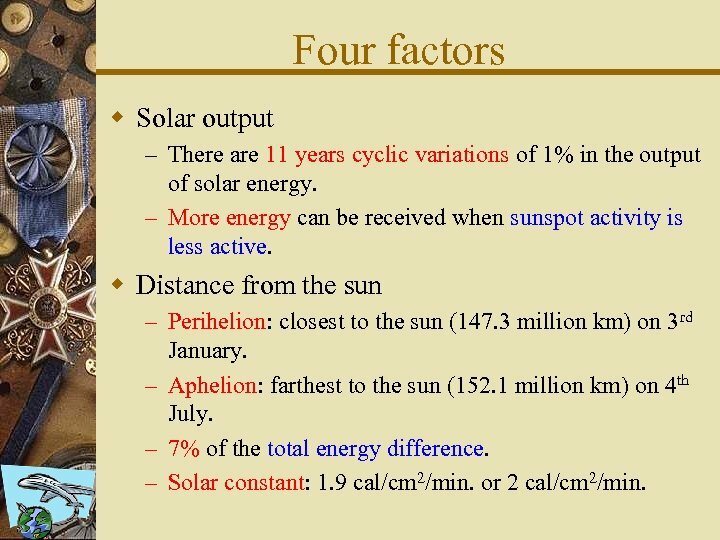 Four factors w Solar output – There are 11 years cyclic variations of 1% in the output of solar energy. – More energy can be received when sunspot activity is less active. w Distance from the sun – Perihelion: closest to the sun (147. 3 million km) on 3 rd January. – Aphelion: farthest to the sun (152. 1 million km) on 4 th July. – 7% of the total energy difference. – Solar constant: 1. 9 cal/cm 2/min. or 2 cal/cm 2/min. 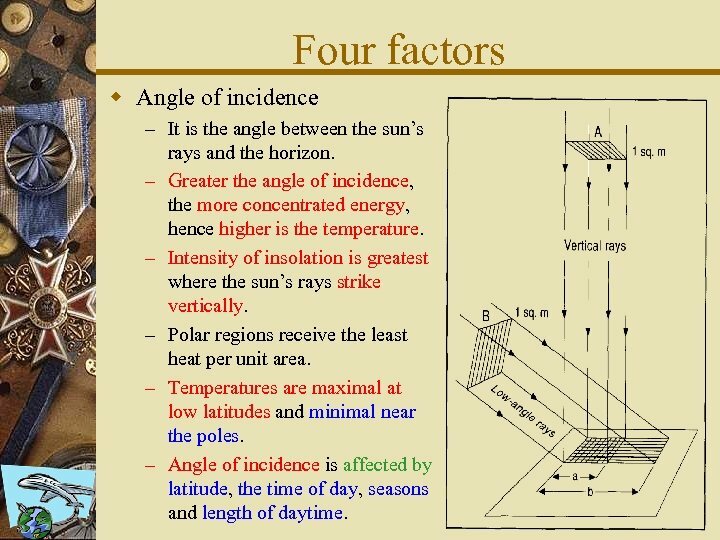 Four factors w Angle of incidence – It is the angle between the sun’s rays and the horizon. – Greater the angle of incidence, the more concentrated energy, hence higher is the temperature. – Intensity of insolation is greatest where the sun’s rays strike vertically. – Polar regions receive the least heat per unit area. – Temperatures are maximal at low latitudes and minimal near the poles. 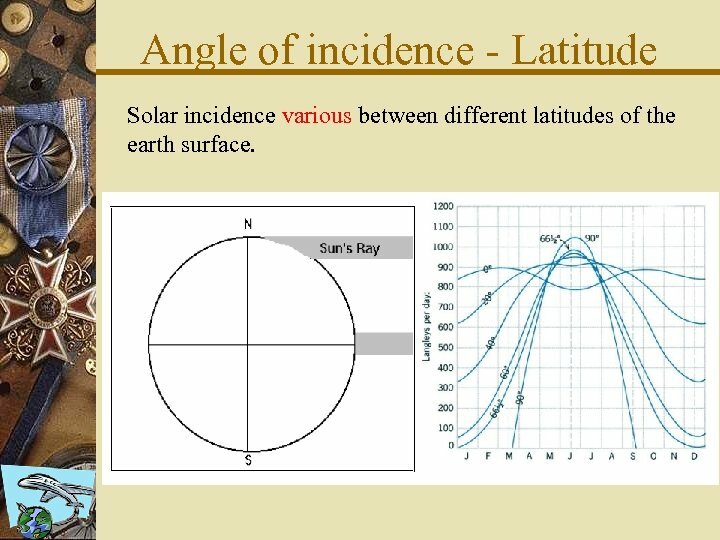 – Angle of incidence is affected by latitude, the time of day, seasons and length of daytime. 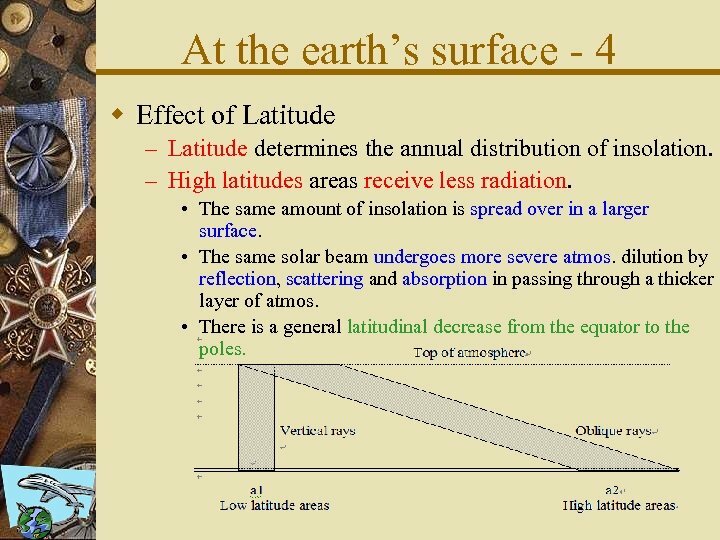 Angle of incidence - Latitude Solar incidence various between different latitudes of the earth surface. 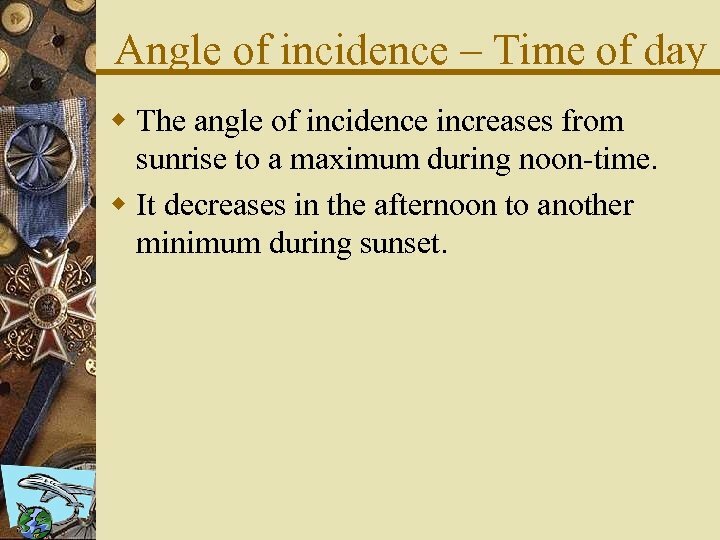 Angle of incidence – Time of day w The angle of incidence increases from sunrise to a maximum during noon-time. w It decreases in the afternoon to another minimum during sunset. 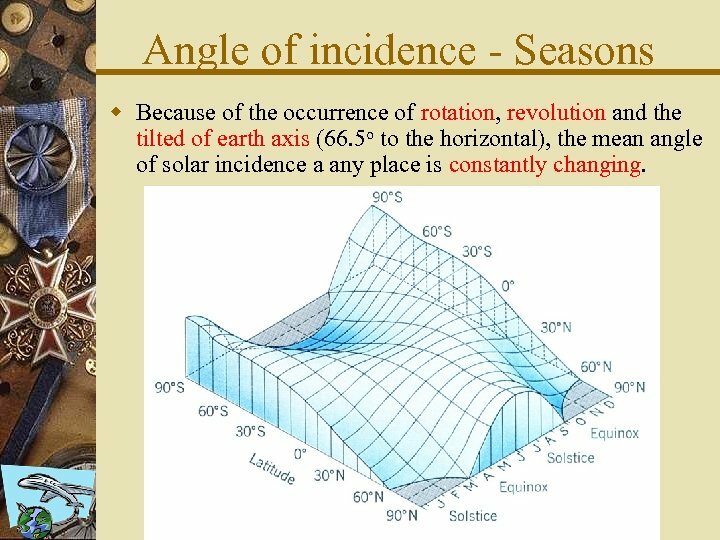 Angle of incidence - Seasons w Because of the occurrence of rotation, revolution and the tilted of earth axis (66. 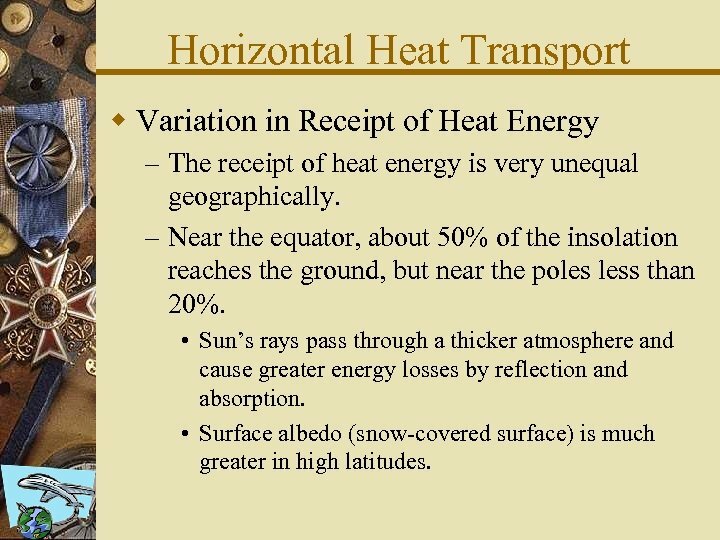 5 o to the horizontal), the mean angle of solar incidence a any place is constantly changing. 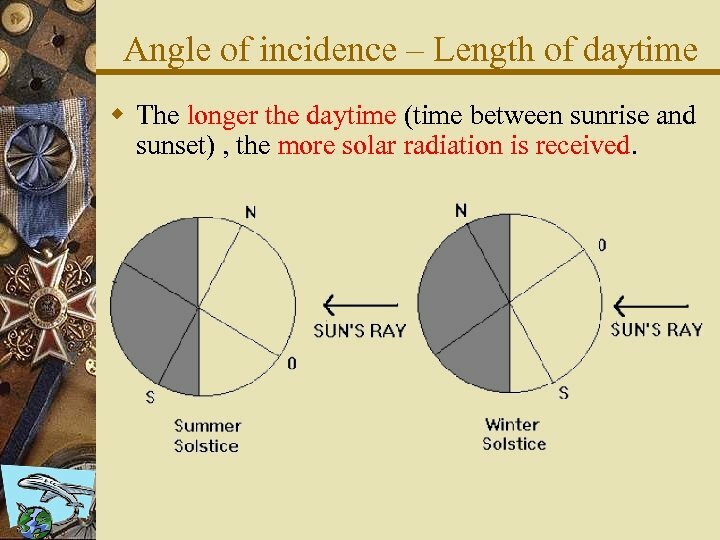 Angle of incidence – Length of daytime w The longer the daytime (time between sunrise and sunset) , the more solar radiation is received. 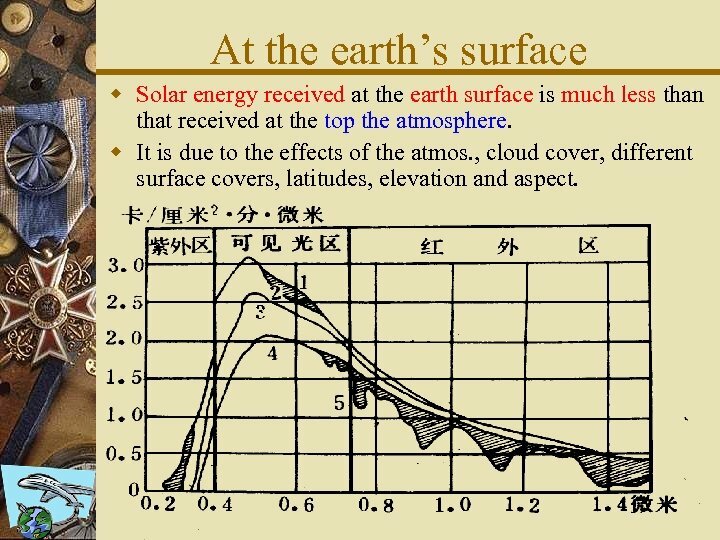 At the earth’s surface w Solar energy received at the earth surface is much less than that received at the top the atmosphere. w It is due to the effects of the atmos. , cloud cover, different surface covers, latitudes, elevation and aspect. 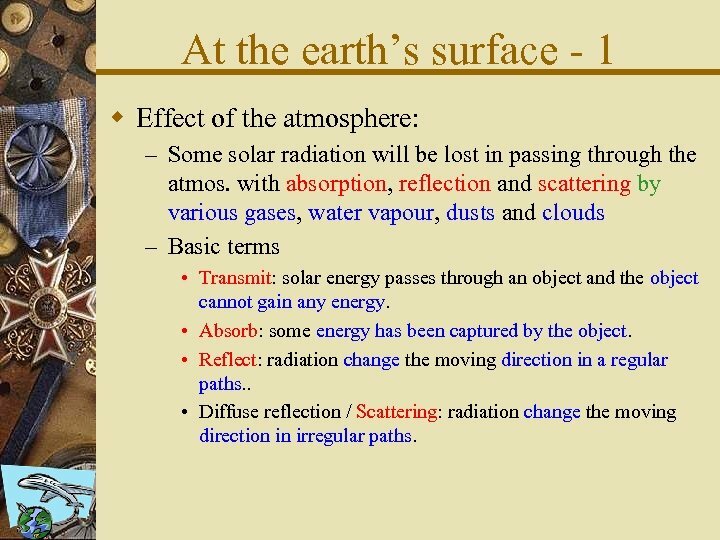 At the earth’s surface - 1 w Effect of the atmosphere: – Some solar radiation will be lost in passing through the atmos. 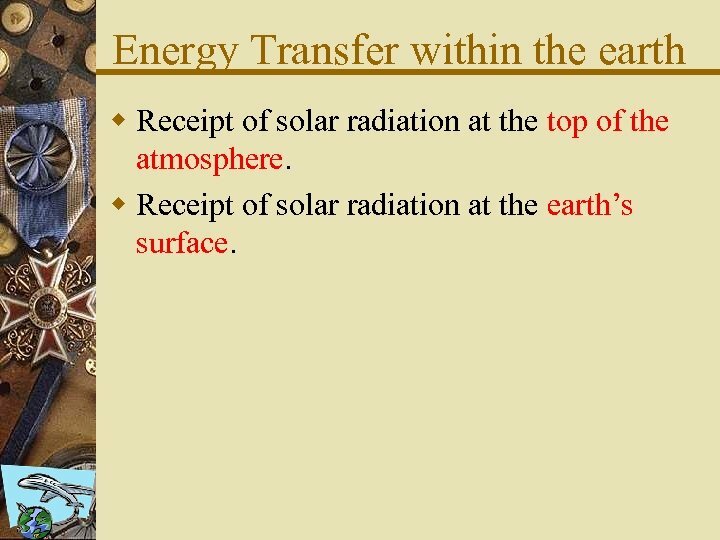 with absorption, reflection and scattering by various gases, water vapour, dusts and clouds – Basic terms • Transmit: solar energy passes through an object and the object cannot gain any energy. • Absorb: some energy has been captured by the object. • Reflect: radiation change the moving direction in a regular paths. . • Diffuse reflection / Scattering: radiation change the moving direction in irregular paths. 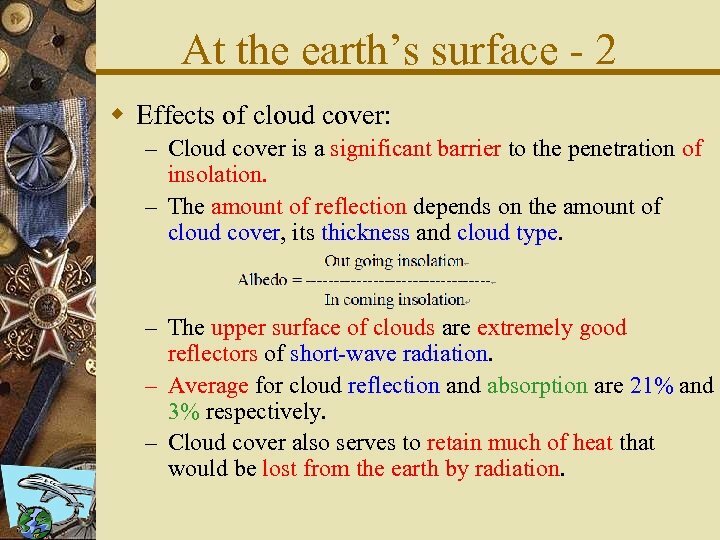 At the earth’s surface - 2 w Effects of cloud cover: – Cloud cover is a significant barrier to the penetration of insolation. – The amount of reflection depends on the amount of cloud cover, its thickness and cloud type. – The upper surface of clouds are extremely good reflectors of short-wave radiation. – Average for cloud reflection and absorption are 21% and 3% respectively. – Cloud cover also serves to retain much of heat that would be lost from the earth by radiation. 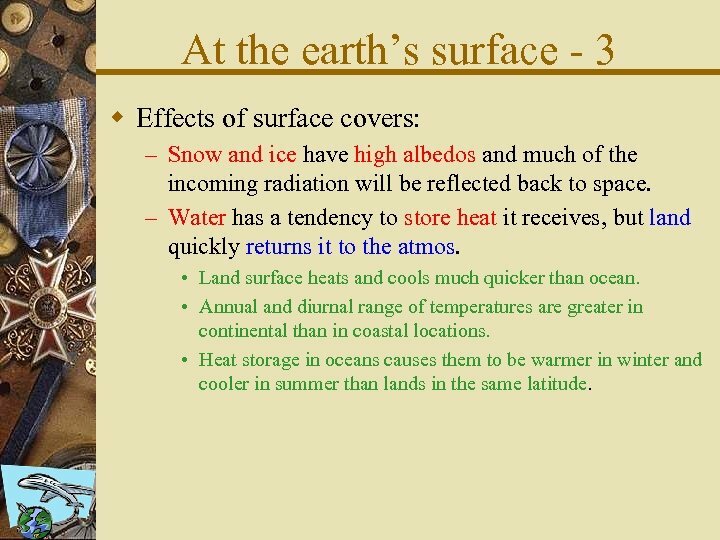 At the earth’s surface - 3 w Effects of surface covers: – Snow and ice have high albedos and much of the incoming radiation will be reflected back to space. – Water has a tendency to store heat it receives, but land quickly returns it to the atmos. • Land surface heats and cools much quicker than ocean. 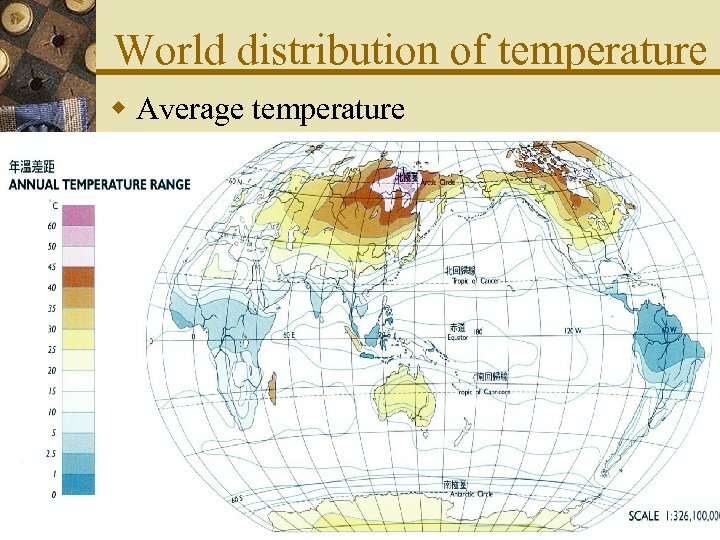 • Annual and diurnal range of temperatures are greater in continental than in coastal locations. • Heat storage in oceans causes them to be warmer in winter and cooler in summer than lands in the same latitude. At the earth’s surface - 4 w Effect of Latitude – Latitude determines the annual distribution of insolation. – High latitudes areas receive less radiation. • The same amount of insolation is spread over in a larger surface. • The same solar beam undergoes more severe atmos. dilution by reflection, scattering and absorption in passing through a thicker layer of atmos. • There is a general latitudinal decrease from the equator to the poles. 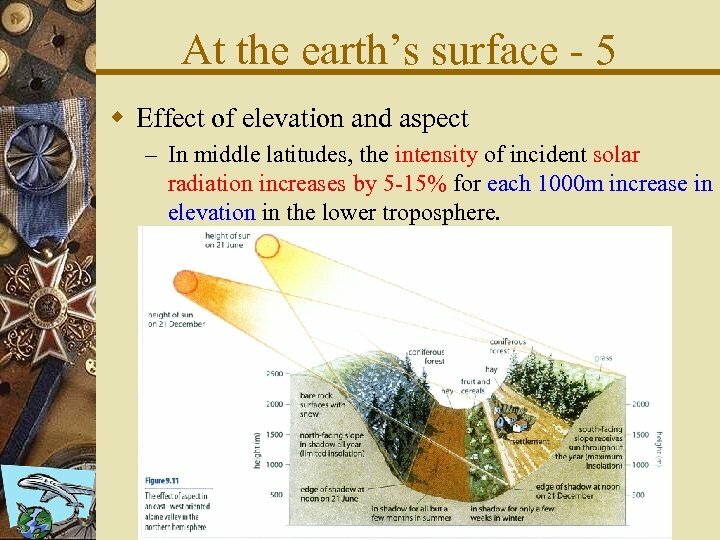 At the earth’s surface - 5 w Effect of elevation and aspect – In middle latitudes, the intensity of incident solar radiation increases by 5 -15% for each 1000 m increase in elevation in the lower troposphere. 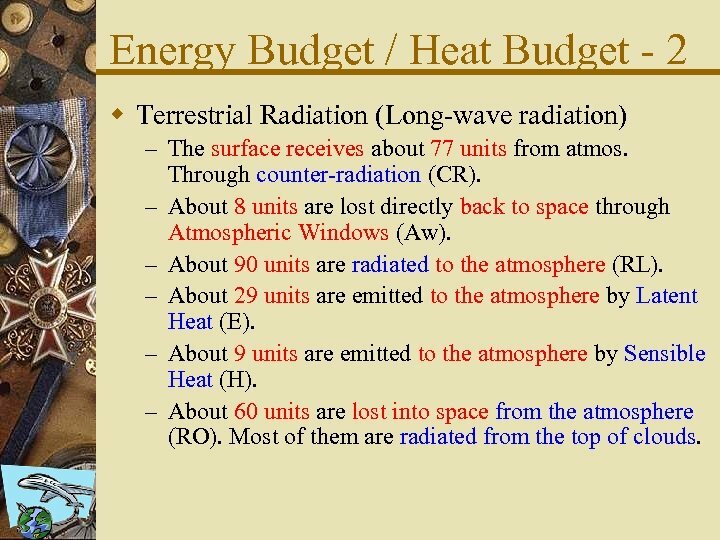 Energy Budget / Heat Budget - 2 w Terrestrial Radiation (Long-wave radiation) – The surface receives about 77 units from atmos. Through counter-radiation (CR). – About 8 units are lost directly back to space through Atmospheric Windows (Aw). – About 90 units are radiated to the atmosphere (RL). 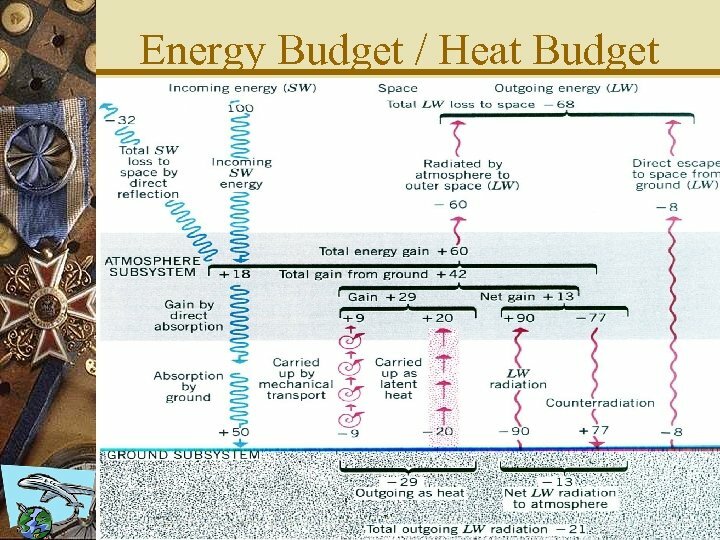 – About 29 units are emitted to the atmosphere by Latent Heat (E). 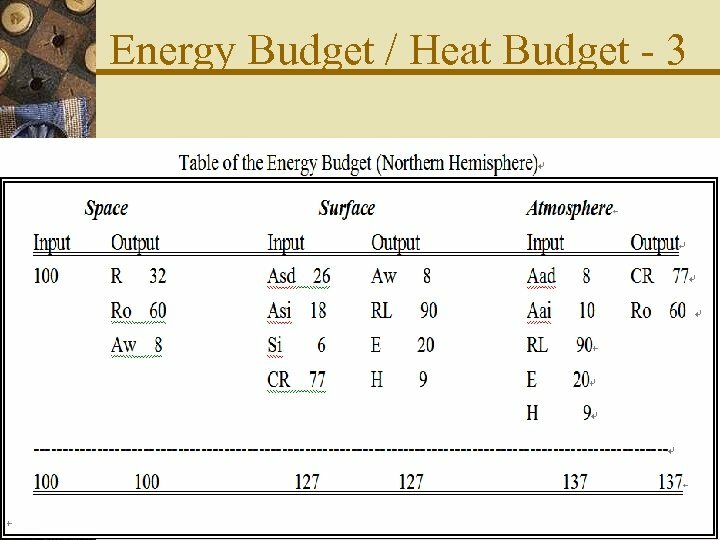 – About 9 units are emitted to the atmosphere by Sensible Heat (H). – About 60 units are lost into space from the atmosphere (RO). Most of them are radiated from the top of clouds. 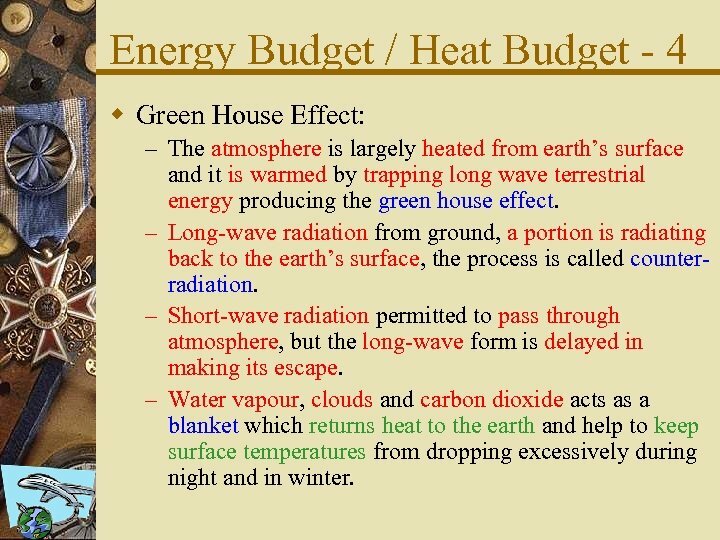 Energy Budget / Heat Budget - 4 w Green House Effect: – The atmosphere is largely heated from earth’s surface and it is warmed by trapping long wave terrestrial energy producing the green house effect. – Long-wave radiation from ground, a portion is radiating back to the earth’s surface, the process is called counterradiation. – Short-wave radiation permitted to pass through atmosphere, but the long-wave form is delayed in making its escape. – Water vapour, clouds and carbon dioxide acts as a blanket which returns heat to the earth and help to keep surface temperatures from dropping excessively during night and in winter. Horizontal Heat Transport w Variation in Receipt of Heat Energy – The receipt of heat energy is very unequal geographically. – Near the equator, about 50% of the insolation reaches the ground, but near the poles less than 20%. • Sun’s rays pass through a thicker atmosphere and cause greater energy losses by reflection and absorption. 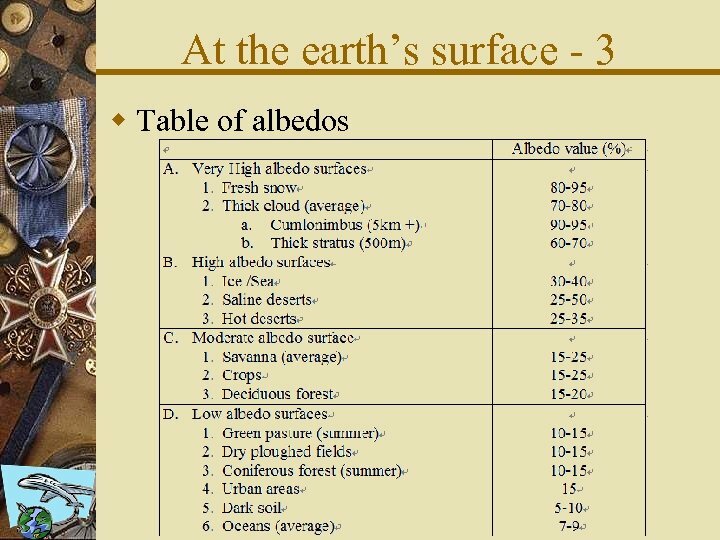 • Surface albedo (snow-covered surface) is much greater in high latitudes. 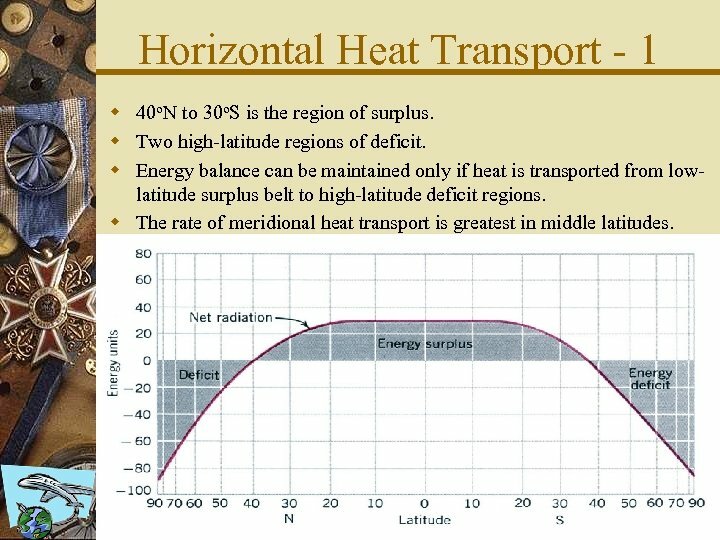 Horizontal Heat Transport - 1 w 40 o. N to 30 o. S is the region of surplus. w Two high-latitude regions of deficit. w Energy balance can be maintained only if heat is transported from lowlatitude surplus belt to high-latitude deficit regions. 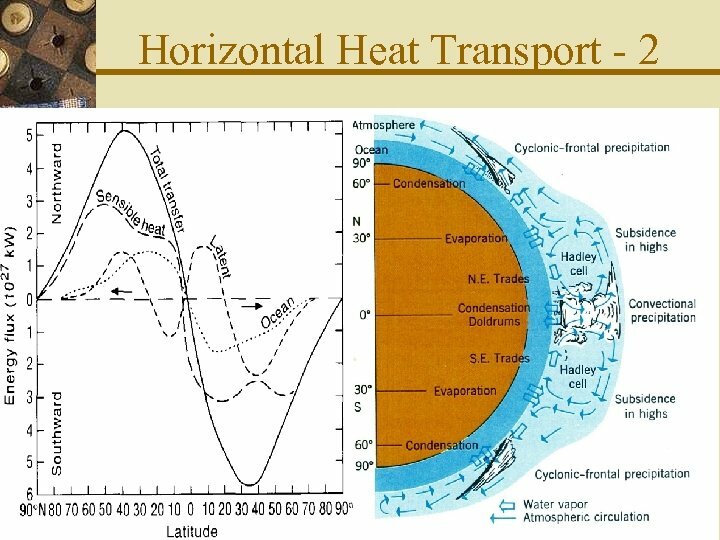 w The rate of meridional heat transport is greatest in middle latitudes. 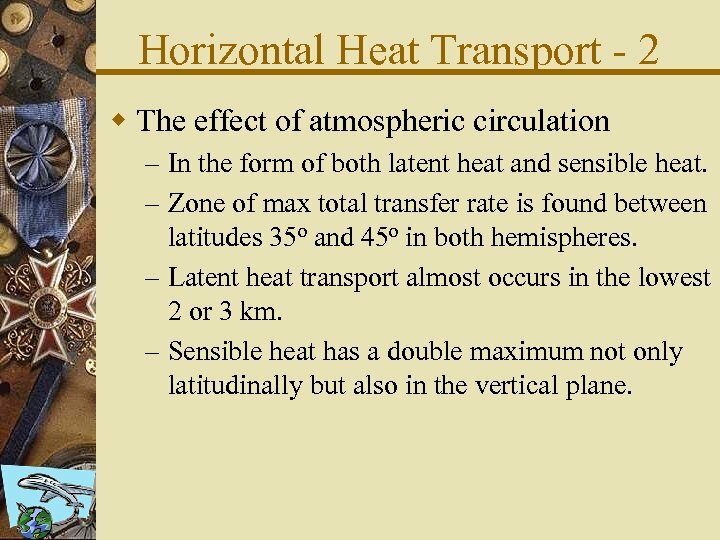 Horizontal Heat Transport - 2 w The effect of atmospheric circulation – In the form of both latent heat and sensible heat. – Zone of max total transfer rate is found between latitudes 35 o and 45 o in both hemispheres. – Latent heat transport almost occurs in the lowest 2 or 3 km. – Sensible heat has a double maximum not only latitudinally but also in the vertical plane. 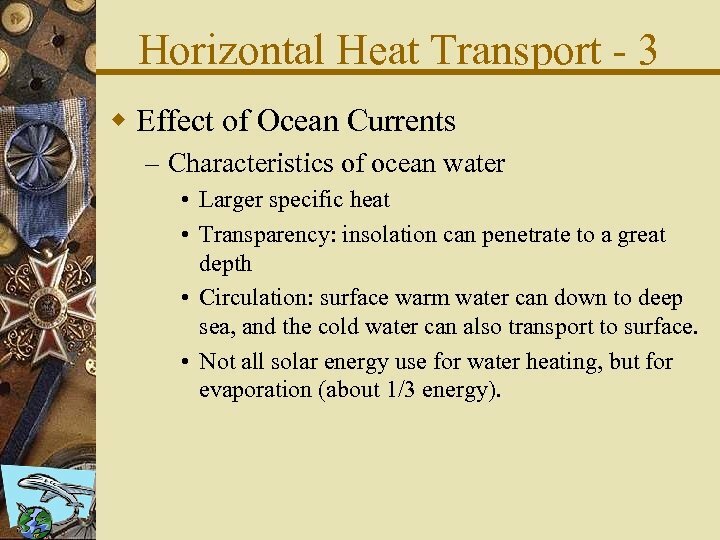 Horizontal Heat Transport - 3 w Effect of Ocean Currents – Characteristics of ocean water • Larger specific heat • Transparency: insolation can penetrate to a great depth • Circulation: surface warm water can down to deep sea, and the cold water can also transport to surface. • Not all solar energy use for water heating, but for evaporation (about 1/3 energy). 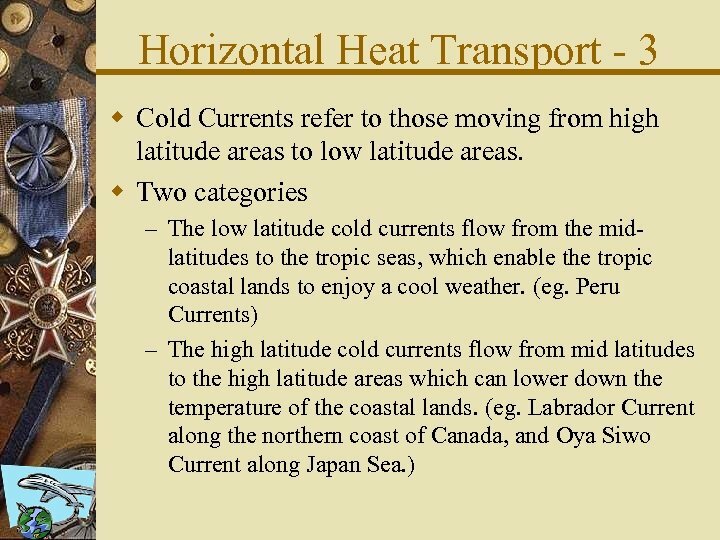 Horizontal Heat Transport - 3 w Warm Currents refer to the sea water from low latitude areas to high latitude areas. – Eg. Gulf Stream, Kuro Siwo Currents. 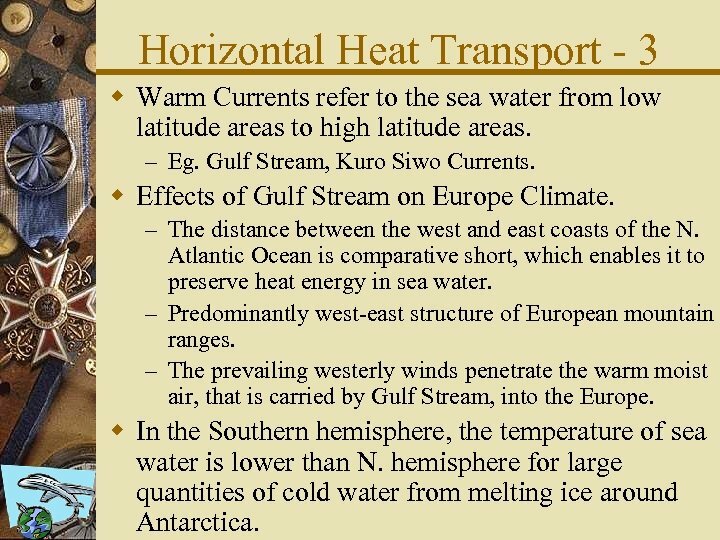 w Effects of Gulf Stream on Europe Climate. – The distance between the west and east coasts of the N. Atlantic Ocean is comparative short, which enables it to preserve heat energy in sea water. – Predominantly west-east structure of European mountain ranges. – The prevailing westerly winds penetrate the warm moist air, that is carried by Gulf Stream, into the Europe. w In the Southern hemisphere, the temperature of sea water is lower than N. hemisphere for large quantities of cold water from melting ice around Antarctica. World distribution of temperature w The annual march of insolation between the summer and winter solstices creates very different patterns. 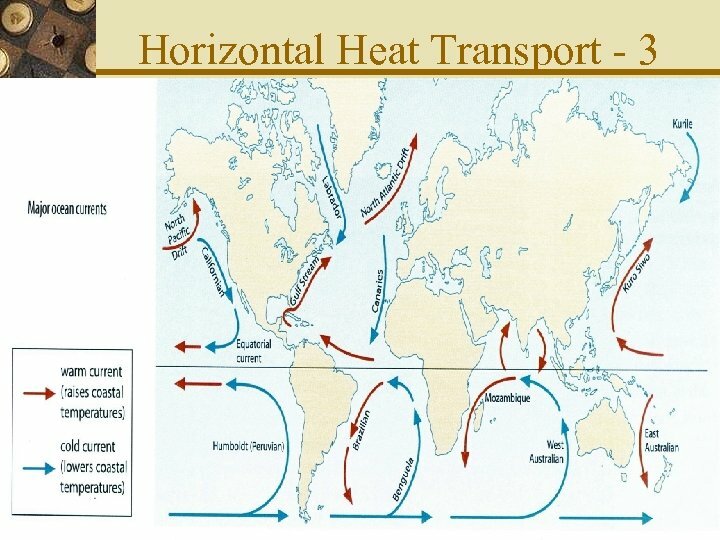 w The thermal effect of land sea distribution, and major ocean currents play an very important role on global temp. distribution. 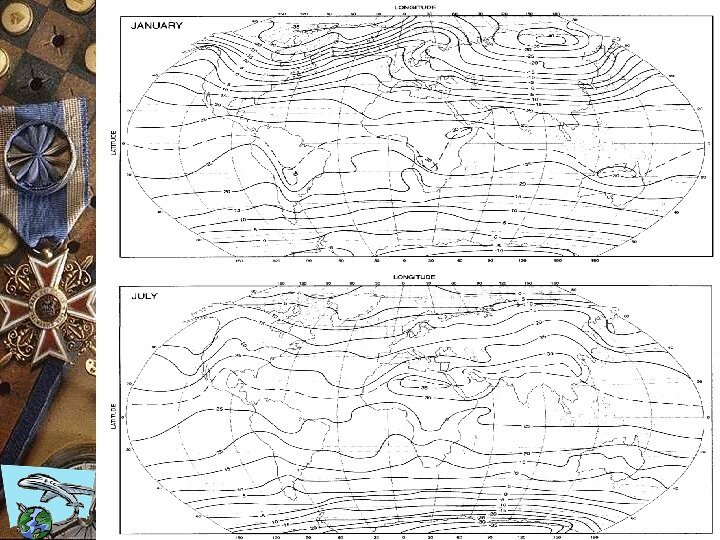 – There is a more pronounced migration and concentration of isotherms over land masses than over the ocean. 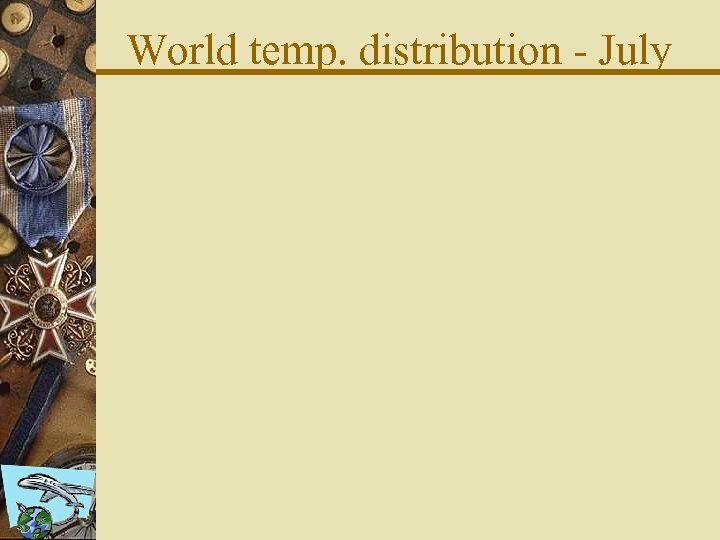 – The annual range of temp. is greater in continental than in coastal locations. (max. 55 o. C at Siberia). – The large heat storage of the oceans cause them to be warmer on average in winter, but colder in summer than land in the same latitude. – The influence of main ocean currents is evident especially in winter (for warm currents) and summer (for cold currents) • Gulf Stream (Warm current) pushes the isotherms poleward in N. Atlantic in January (winter in N. hemisphere). 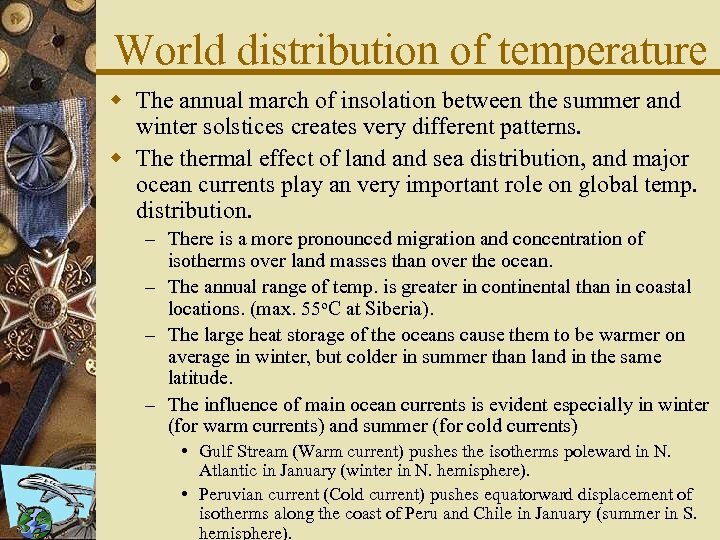 • Peruvian current (Cold current) pushes equatorward displacement of isotherms along the coast of Peru and Chile in January (summer in S. hemisphere). 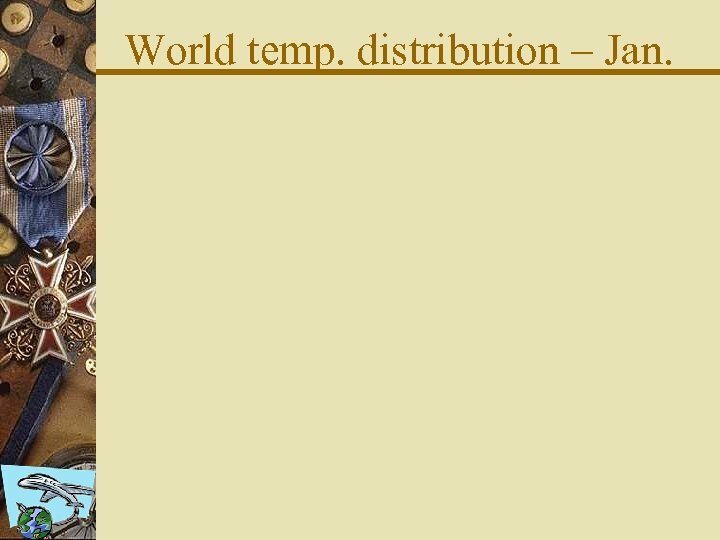 World temp. 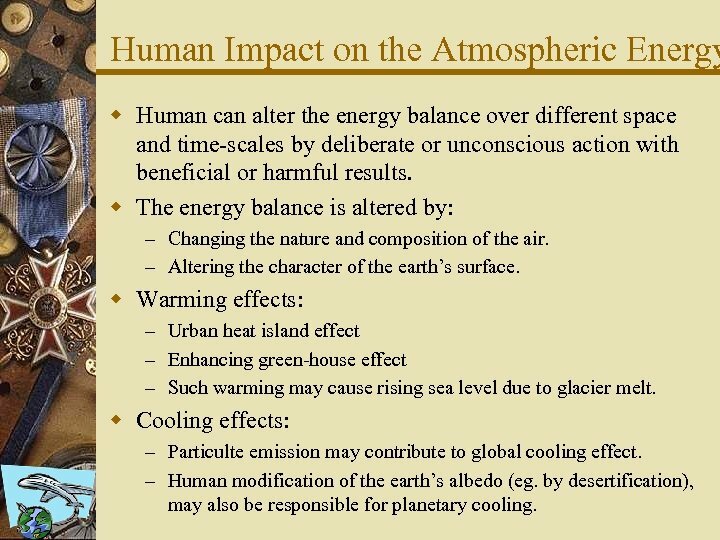 distribution – Jan.
Human Impact on the Atmospheric Energy w Human can alter the energy balance over different space and time-scales by deliberate or unconscious action with beneficial or harmful results. 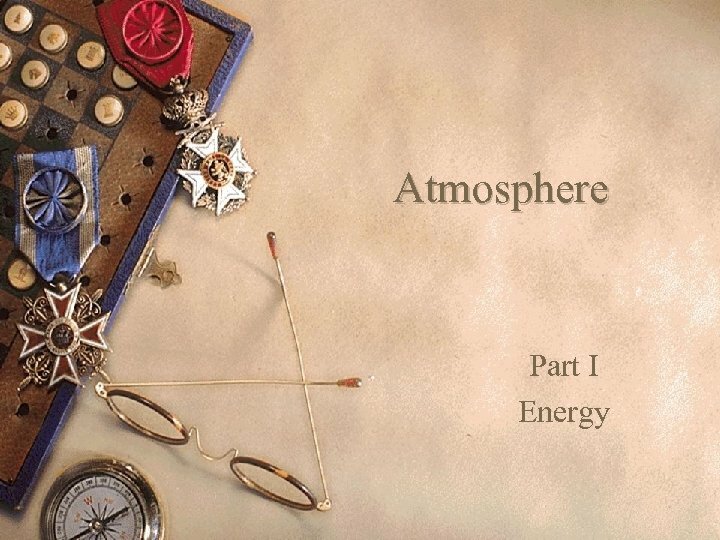 w The energy balance is altered by: – Changing the nature and composition of the air. – Altering the character of the earth’s surface. 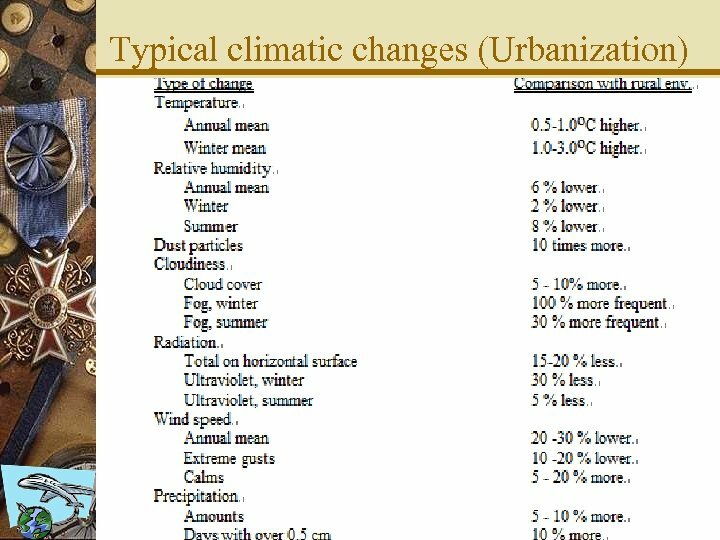 w Warming effects: – Urban heat island effect – Enhancing green-house effect – Such warming may cause rising sea level due to glacier melt. w Cooling effects: – Particulte emission may contribute to global cooling effect. – Human modification of the earth’s albedo (eg. 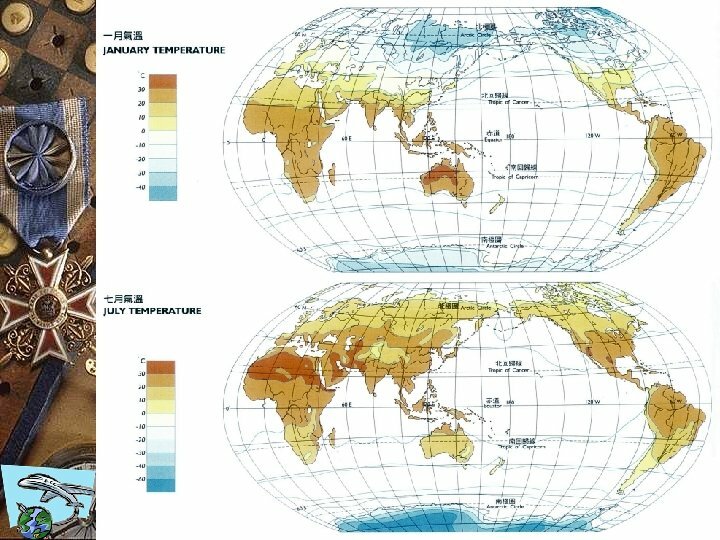 by desertification), may also be responsible for planetary cooling.